Applying a blanket rule: Are you over-rugging your horse? Owners who rug their horses all year round may be compromising welfare, according to researchers, especially if inappropriate covers are chosen. Researchers concluded that some types of rugs can significantly increase body surface temperatures beyond those considered comfortable for the horse. The findings of a pilot study into the effects of different rug types on the body surface temperature of horses were presented at the recent International Society of Equitation Science conference in Rome. 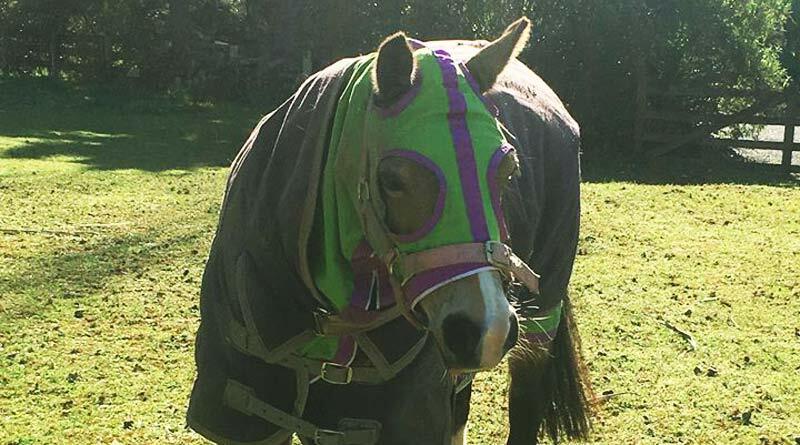 It has become routine, and even fashionable, for many domestic horses to be rugged all year round – in fly-sheets, all-weather turnouts, stable rugs, fleeces or perhaps even a onesie. Rugs can be useful in protecting horses from biting insects and in adverse weather conditions. However, until now, there have been few studies on rugging, and none on how different types of rugs affect a horse’s body temperature. Like humans, horses have a thermoneutral zone (TNZ) – an optimal range of temperatures within which they can comfortably maintain their own body temperature. For adult horses in mild climates, this is between 5 degrees Celsius and 25°C. Humans, on the other hand, have a more limited TNZ of between 25°C to 30°C when naked. This means when humans feel cold, horses are still well within their comfortable zone. Humans often make decisions about rugging their horses based on whether they feel cold themselves, so they may well be using a rug on their horse when it is not necessary. The pilot study was conducted by Kim Hodgess, a Master of Science student from Duchy College, England. Hodgess and her colleagues studied horses routinely rugged as part of their management routine. Ten were kept stabled indoors and two were kept at pasture. Three of the horses wore sweet itch rugs (a lightweight, non-waterproof rug used to protect from biting insects which covers most of the body, including the neck and belly), six wore fleeces, two wore light quilted rugs, and two control horses were unrugged (one stabled and one at pasture). The surface temperature of each horse was taken by taping a small temperature data logger directly to each horse, just below the point of their hip. The environmental temperature was also recorded using temperature data loggers attached to either the horse’s stable door or to a wooden mounting block in the field. All temperatures were recorded every minute for 24 hours. The horses wearing sweet itch rugs had an average temperature increase of 4.2°C, while those wearing fleeces were 11.2°C and those wearing light quilted rugs had an average increase of 15.8°C. The horses wearing fleece and light quilted rugs were found to have a significant increase in surface temperature. Four rugged horses had surface temperatures between 24°C and 30°C, compared to the control horses at 12.5°C to 18.5°C, when the environmental temperature had fallen below the TNZ to 4°C to 4.5°C. The researchers concluded that some types of rugs can significantly increase horse surface temperature beyond those that are comfortable for the horse and could therefore compromise the horses’ capacity to regulate its own temperature. While the use of rugs and blankets may be necessary for some horses, selecting the right type and weight of rug for each horse and its individual conditions is vital. Appropriate use and application must be seriously considered to ensure they do not impact on horse welfare. “This study was interesting for me as it has left me asking many more questions about the welfare of rugged horses,” Hodgess said. “Questions that remain unanswered for me are: Do dark coloured sweet itch rugs increase horse temperature, do rugs interfere with mutual grooming, and can skin condition deteriorate with prolonged use of rugs? Hodgess said she would like to continue this area of research. “I feel there is a lot more that could be investigated.